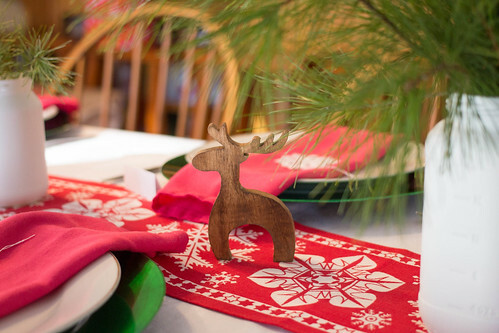 We took elements from three beautiful vintage swedish table runners, including red, green, white, snowflakes and reindeer, and attempted a simple setting for 16 people. 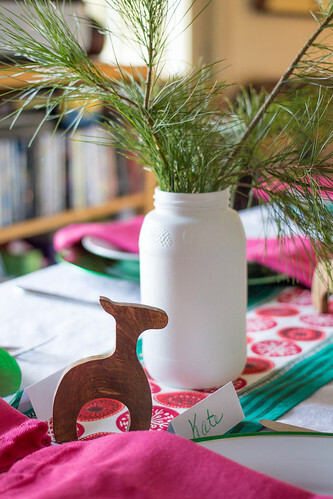 While I was working on another Christmas project, Nehill kindly cut out some reindeer from a pattern I drew up for another Christmas project... He cut them from maple, and I stained them darker for a nicer contrast to the white tablecloths. During the reindeer cutting process, Nehill spotted my design flaw. I had no does for the reindeer! He remedied that. Did you recognize the white jars? My mom and I snipped some tree branches from the back yard to make some simple bouquets. I thought they turned out pretty cute. And they smelled pretty good. And they made a pretty nice natural environment for the reindeer and lady deer. 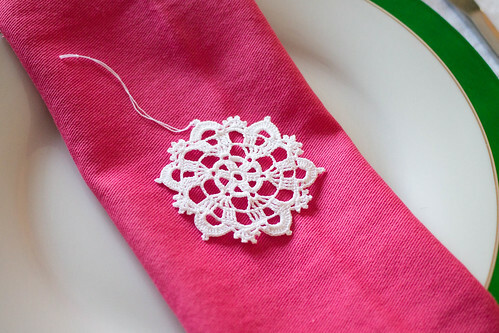 For each place setting, I crocheted snowflake ornaments. I used a pattern from a Japanese crochet book, size 30 thread and a size 14 crochet hook, and then starched the finished snowflakes. 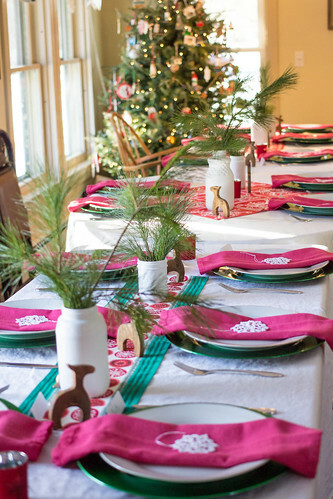 Because my sister and I are, as our mom calls us, "table divas," our mom dyed some white napkins red for us! She was unhappy with them and thought they were a little bit pink, but I thought they worked! 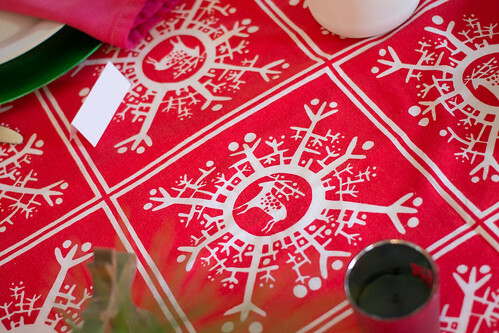 These incredible table runners I bought from the Etsy shop NORDICARTCURIOSITY. I almost didn't want to share the link so I could keep all the beautiful swedish vintage goodness to myself! Aren't they gorgeous?! 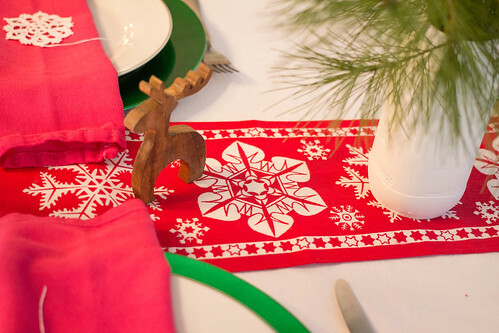 I may just have a vintage Swedish table runner addiction. Well, I was pretty happy with the table, and hope everyone else liked it too! 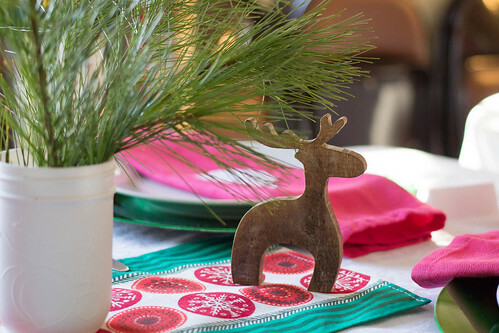 What a fantastic table setting , I too love all things scandi/Nordic! Thank you so much Helen! So nice to have a fellow Scandi-lover! 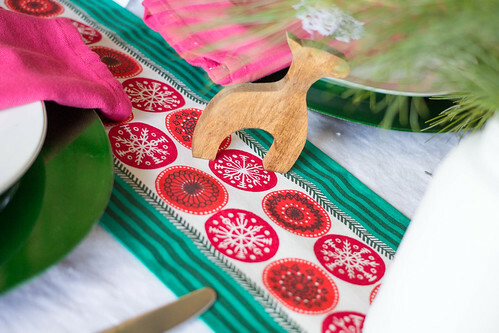 Such a festive Christmas table in the Scandinavian style! 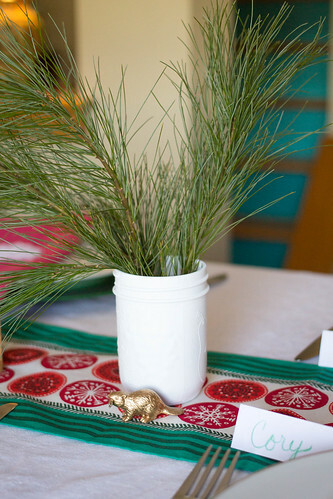 I love your pretty crocheted snowflake ornaments and the deer with their doe!